Global Women Strike 2 marks yet another sell-out show for Pro Wrestling: EVE, who remain at the forefront of women’s professional wrestling, both at home and abroad. 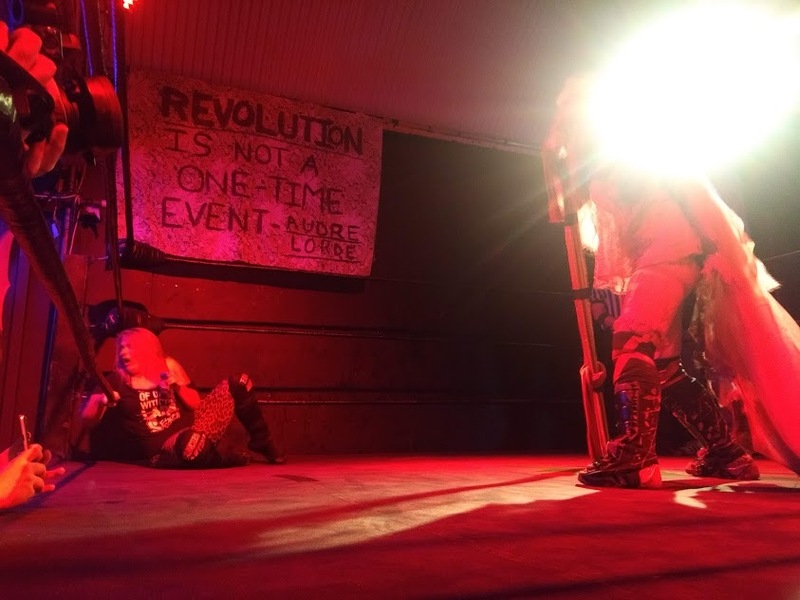 Since their triumphant return to the BritWres scene in 2016, EVE have amassed a reputation as a promotion whose shows are consistently high-quality (and, perhaps most importantly, consistently fun). 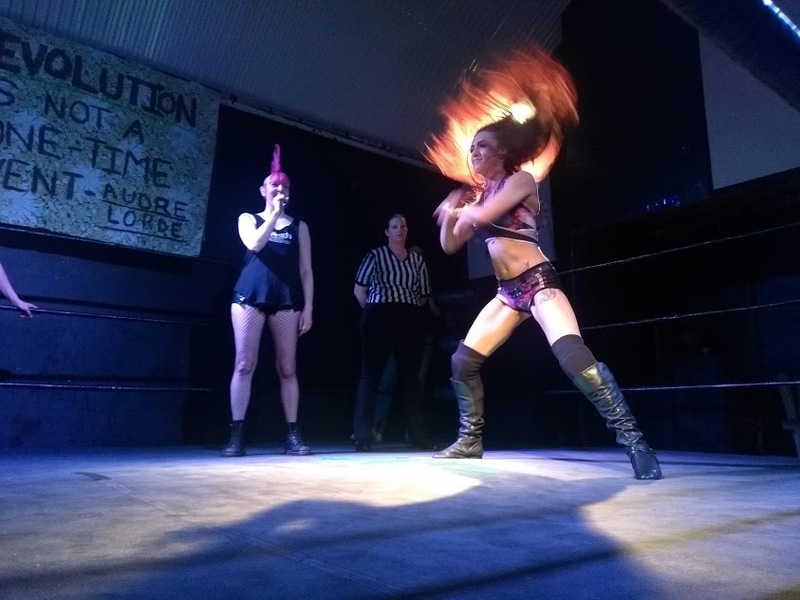 Last year’s Global Women Strike gifted us a bevy of international stars; the likes of Meiko Satomura, Holidead, Hana Kimura, Kris Wolf and Jazzy Gabert all brought the ‘Global’, as EVE demonstrated that it is not just here for British women’s wrestling, but women wrestlers worldwide. 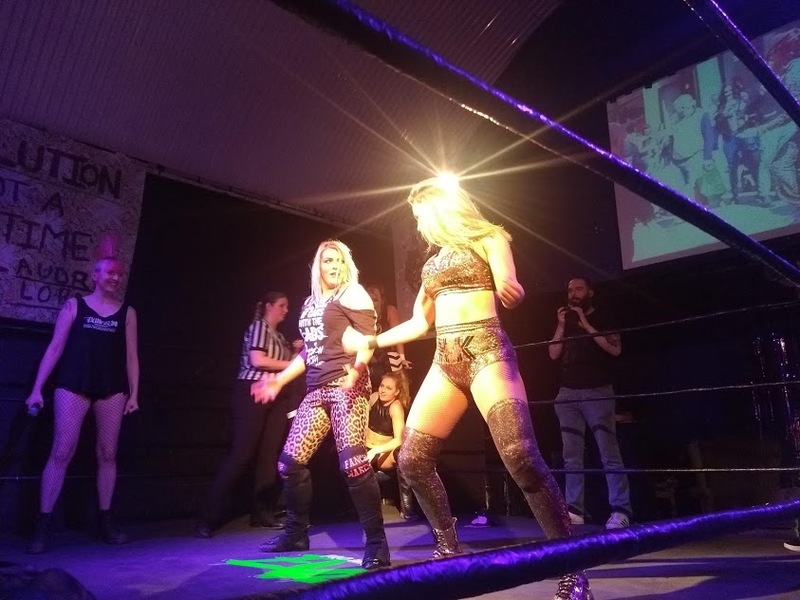 This year’s show remained committed to showcasing international talent; Mercedes Martinez and Mary Apache made their EVE debuts, while returning favourites Yuu and Emi Sakura brought their Joshi expertise to the Bethnal Green faithful. Coventry’s loudest was on top verbal form, bigging up EVE regular Erin Angel and calling out Charli Evans and Millie McKenzie, who callously attacked Jetta and Angel at She Who Dares, Wins: “We haven’t forgotten what happened in January and we are going to come for you,” Jetta declared. Do Jetta and Erin Angel have their eyes trained on the EVE Tag Team Championships? Unsurprisingly, that wasn’t all Jetta had to say. She declared that while she might be no Carol Vorderman, she’s lost so many tournaments that by the laws of probability, tonight should be her night. Jetta Maths might be marginally more intelligible than Steiner Maths, but it was clear she wasn’t convinced of her own calculations, as shenanigans ensued from the moment Kay Lee Ray set foot in the ring. But Jetta had another trick up her sleeve. A well-hidden pack of playing cards proved the perfect distraction as a card trick quickly transformed into a superkick. Ray recovered her bearings quickly, setting Jetta up for the Gory Bomb, but Jetta thought on her feet, reversing into a roll-up for the two count. Shenanigans brushed aside, the pace picked up and the two looked to be evenly matched: Jetta kicked out of a Gory Bomb, while Ray refused to lay down for Jetta’s twisting neckbreaker. But in the end the law of probability was not on Jetta’s side: a Tornado DDT following by another brutal Gory Bomb saw Jetta down for the three count, and those numbers don’t lie…(sorry). 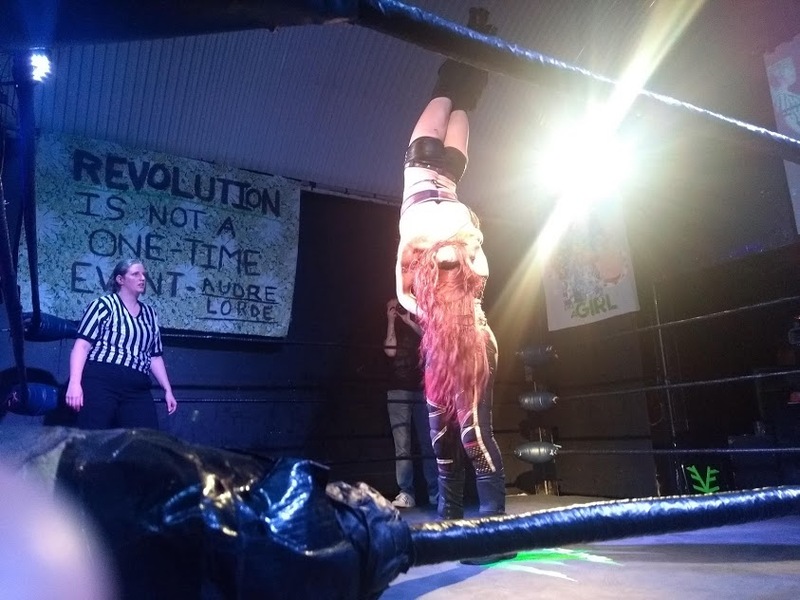 Post-match, Charlie Morgan made her way down to the ring, sizing Kay Lee Ray up. She said she believed Ray would go on to win the title. 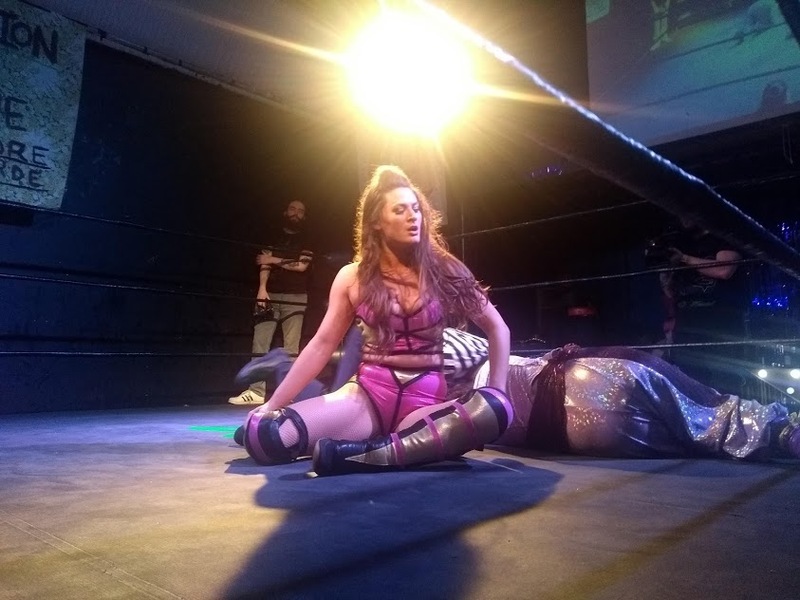 “And when you win the Pro Wrestling Eve Championship, I want a rematch.” But as Charlie Morgan reminded us, she is yet to beat Kay Lee Ray in singles competition – and Ray, for her part, seemed unperturbed by Morgan’s challenge. You have to give it to Laura DiMatteo: she never backs down, or gives up. She’s one of EVE’s most compelling babyfaces for precisely this reason. Fierce and diminutive, she’s got so much heart that it’s impossible not to root for her. Unfortunately, she’s not had a great few months in terms of her scoresheet, but it doesn’t seem to have dampened her spirit, and like all good babyfaces you believe every time that this could be her night. But Mercedes Martinez is a force of nature. Her Mae Young Classic runs have been incredible – her match against Meiko Satomura was one of my picks for 2018 Match of the Year. So it’s incredibly exciting to see her make her EVE debut, and Laura DiMatteo’s speed and heart made her the perfect foil for Martinez’s power and aggression. This was a great match, and though Martinez ultimately took DiMatteo out with a brutal dragon sleeper, DiMatteo’s struggle against adversity made for the perfect story. 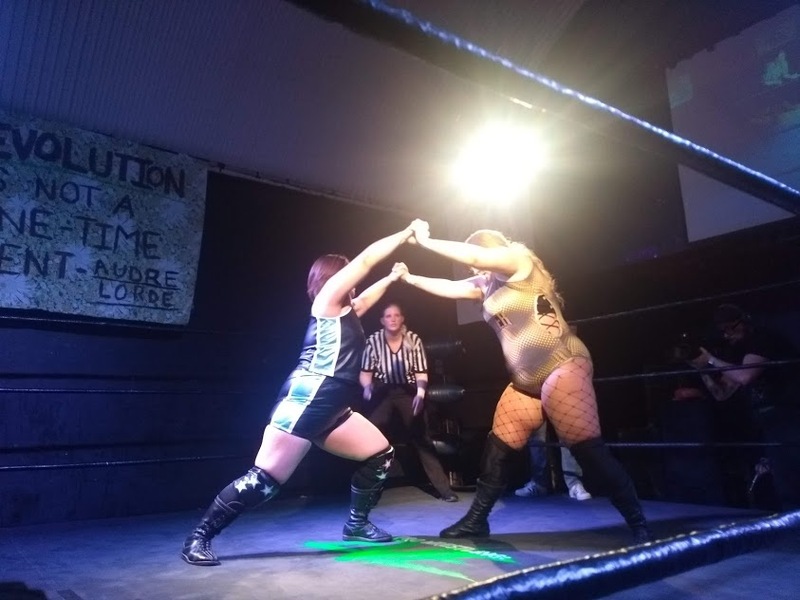 Adorable powerhouse Yuu took on British wrestling favourite Viper in a bruising battle which nonetheless was good-spirited from start to finish. The two traded crushing blows, thundering chops and cannonballs in every corner. Frankly, it was impressive that they both made it to the finish line with the sheer amount of punishment levelled on all sides. 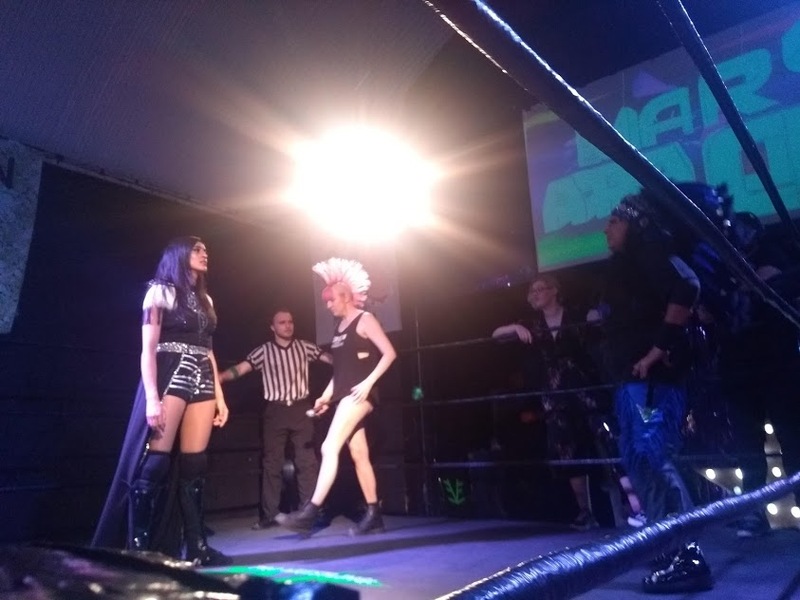 Viper is never anything less than totally entertaining, and Yuu has found herself a loyal following in the UK thanks to stellar performances across EVE and Revolution Pro Wrestling. This was the last show of her UK tour, but I’ll be surprised if she doesn’t return – she’ll be welcomed very warmly indeed, if she does. This was, as you might expect, a very even match, but it was Viper who got the better of Yuu, hitting her with a crushing Michinoku Driver. 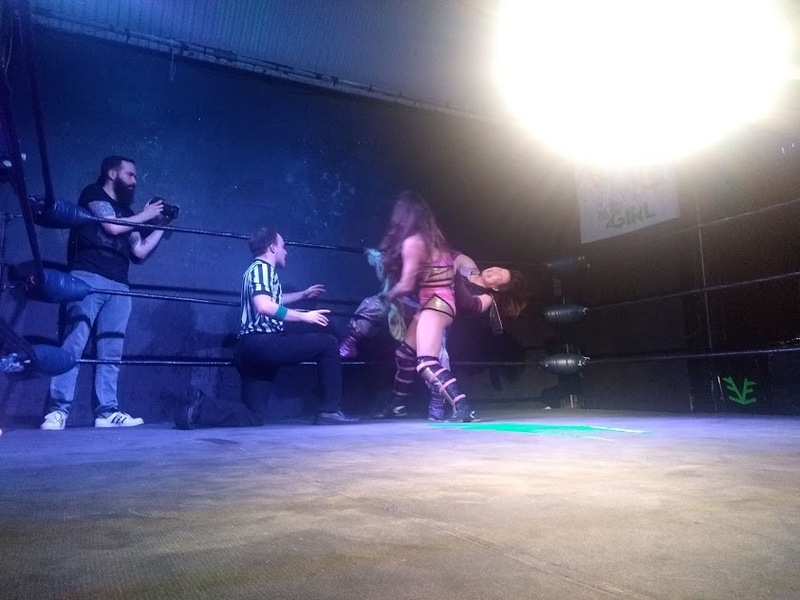 The delightful Erin Angel made her entrance, but her night was cut short when Charli Evans and Millie McKenzie attacked her, apparently just because they felt like it. That’s how Millie McKenzie rolls these days and it’s a tad unnerving to see her rock the stroppy teenager look. Jetta came to Erin’s aid, but it was too late. She was helped backstage by the crew, unable to continue. With Erin taken out, we moved straight on to our next match, and a familiar face returned, unexpectedly, to the EVE fold. Jinny swanned back in like she’d never lost that Loser Leaves EVE match back in December. And in fact, as Jinny took great pains to inform us, she actually hadn’t lost at all: her foot was on the rope, making the pinfall null and void. All of which means the Primark Princess is officially allowed back in the EVE ring. 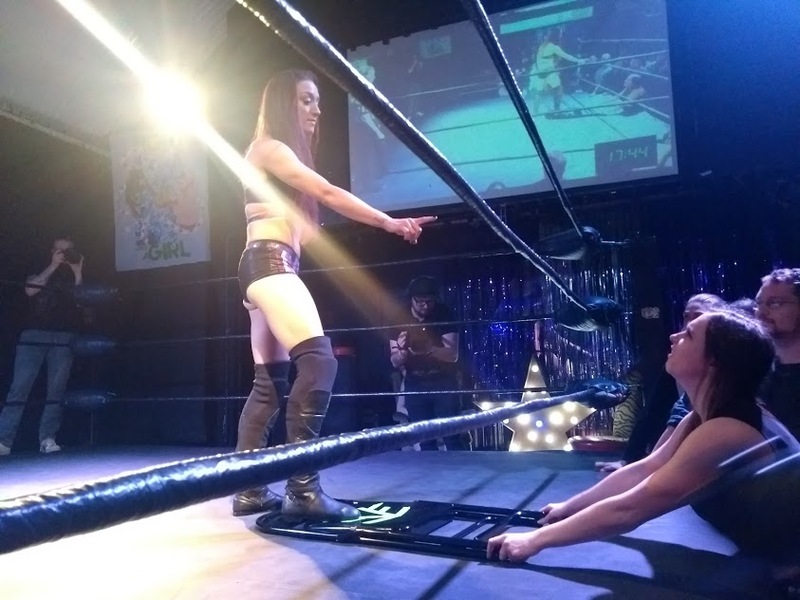 As a welcome back gift, official EVE match fixer Rhia O’Reilly gave Jinny the honour of welcoming the debuting Mary Apache. The legendary luchadora has spent the last few years gracing the ring over at Stardom, winning the High Speed Championship during her tenure. She looked every bit the assured, confident veteran in her first ever EVE match, trading holds with Jinny, whose creativity and innovative ability was tested to its limit. Apache wore Jinny down with her power advantage, issuing a violent clothesline and following up with a massive powerbomb for a two count. Jinny might be wily, but Apache has decades of experience, and a hell of a Michinoku Driver in her arsenal. Perhaps not quite the triumphant return Jinny had been hoping for. Charli Evans and Millie McKenzie have their sights set on tag team gold, and they are taking their partnership seriously. 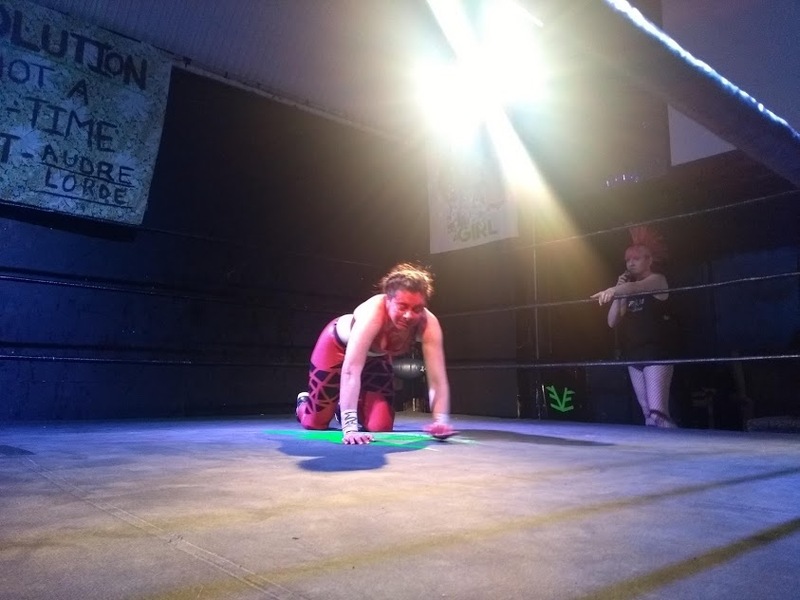 The newly named Medusa Complex looked ready to go when they took on the inspired duo of Session Moth Martina and Heidi Katrina, who came to the ring with an Essex flag around her shoulders and should be considered Essex’s ambassador to the world instead of a certain aerial assassin. Martina expressed her great disappointment at daughter Millie’s recent bad behaviour, but McKenzie was unmoved. Not even the threat of a grounding could sort out her attitude, and she and Evans soon cornered Martina, isolating her in their corner while Katrina yelled encouragement. Evans and McKenzie were calculating and aggressive – I suspect other budding EVE tag teams are going to have their work cut out in keeping the titles out of their hands. Martina is always a joy to watch, and tag partner Heidi brings a uniquely flashy Strong Style inspired flair – her sheer strength is a spectacle, and she’s an excellent addition to the EVE roster. But Evans and McKenzie have this tag thing well scouted, and their coordination saw them hoodwink Martina into accidentally taking out Katrina. A McKenzie suplex saw Katrina taken out of the game, allowing The Medusa Complex to double-team Martina for the win. Martina stuck around after the match for the bantz but probably wished she hadn’t. The room went dark. Sinister music kicked in. An undead bride stalked through the crowd. Su Yung had arrived. Su Yung is a hell of a sight up close. Snarling and utterly uncanny, the Bloody Undead Bride is brilliantly old school. Luckily, Fearless Charlie Morgan was unfazed, and what started as a wrestling match quickly became an all-out brawl. Morgan hit a dive to the outside, taking Su down with her, and the action spilled out into the crowd. Beer flew. Chairs were wrecked. Attempts to quell the chaos were ignored. Su Yung would not be restrained, and Morgan was all too happy to oblige her. Morgan seemed to be gaining the upper hand, but Su Yung was implacable. And however good Morgan might be, she’s not without flaws. Her fatal error here was to let her ego get the better of her. Sending a message to Kay Lee Ray with an attempted Gory Bomb allowed Su Yung to turn the tables. A faceful of red mist and Charlie Morgan was done. A beautiful spinning Samoan Driver scored Su the three count. Keeping this debut secret was a stroke of genius on EVE’s part – the crowd was audibly delighted to see Su Yung, and based on this performance, I sincerely hope she’ll be back sooner rather than later. Mercedes Martinez is really. really strong. You’ve not lived until you’ve seen Mercedes Martinez pull off a string of delayed vertical suplexes on one of the toughest competitors ever to step into an EVE ring. This was everything you might hope for from a match between these two: Martinez wears her experience and expertise in everything she does, and Kay Lee Ray is hard as nails. It’s great to see her looking vibrant and healthy after her recent hiatus. Nina Samuels must surely be one of the most accomplished and brilliant heels in British wrestling right now. Accruing Zack Gibson levels of nuclear heat, she was booed so loudly every time she tried to get a word in that even if the microphone had been switched on she would have been inaudible. Nina’s character work is sublime; she carries herself with the perfect poise, forms the perfect facial expressions. Emi Sakura, on the other hand, is an amazing never-say-die babyface. Decades of Joshi experience makes her almost impossible to take down; the former Pro Wrestling: EVE champ has honed her craft to perfection, and her furious determination makes her incredibly compelling to watch, especially when pitted against someone as well-loathed as Samuels. Samuels’ brilliance lies in her ruthless streak. She’s not just all mouth and no action. She’s got the credentials to back up her claims, and though her tactics are unquestionably dirty, they’re also incredibly effective. So when Sakura tweaked her knee following a missed moonsault, Samuels zeroed in like a shark scenting blood. She relentlessly targeted Sakura’s injured knee, and though Sakura mounted a spirited comeback – a stunning backbreaker almost had Samuels down and out – Samuels dialled up the cruelty to 11. Tying Sakura’s leg to the ring rope, Samuels unleashed a vicious attack on her trapped opponent. Disturbed by the degree of punishment, Rhia O’Reilly intervened, throwing in the towel on Sakura’s behalf. Nobody knows knee injuries like O’Reilly does. The match ended in a no contest, and Samuels walked away with the EVE Championship. Nina Samuels will defend her title against Kay Lee Ray in the not-too-distant future – and Ray is determined to take the title from her. Will Kay Lee Ray have the strength and endurance to push Samuels to the limit? Or will Samuels’ dirty tricks come through for her yet again? Did you attend EVE’s sold-out show? Were you excited to see Su Yung appear?